…in their tracks and leave you with one grateful pup. As is the case with other Advantix products, this one is water proof. So feel free to visit the lake and hose the dog down afterword, as you’ll need to remove various lifeless bug bodies anyway. Make sure to keep this product away from cats and other pets, it is a very dangerous formula for those of the feline persuasion. My dogs are 1years old 5kgs maltiz. Is it safety to use this products with 'Heartgard' chewable medicine ? Yes it is safe if your dog is a year old and 5 kgs. Advantix repels fleas and ticks but this product doesn't cover heartworms or any other internal parasites. I will use Avantix with Advocate for my 4.5kg Poodle. Can I apply them together or better apply separately with terms? If use separately, what would be the recommended term between two applications? You can apply them together. In this particular product there are 12 doses. You need to purchase three packs. Can you please let me know if I can use advantix flea & tick treatment for puppy 4 months old? Is the price in AUD? is delivery to beecroft nsw free? 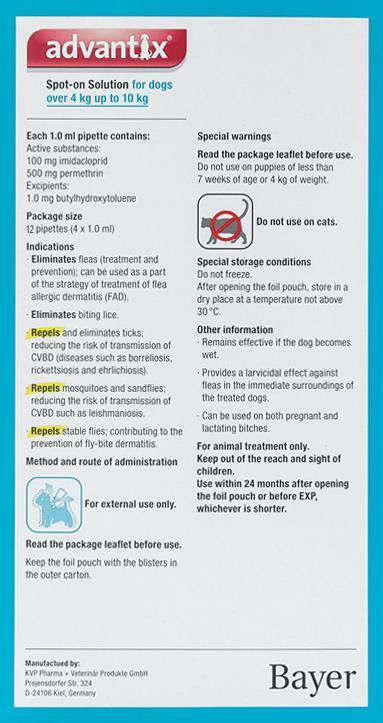 You can use this products on dogs older than 7 weeks old and heavier than 4kg (8.8 lbs). All our prices in USD and we have free shipping all over the world for orders over $20. Great products and prices. Fast shipping! They always have what I need in stock! This product was excellent, great price and quick delivery, will be back. Thank-you Russell.